Salads are my mainstay during the day for lunch and most likely because I get to torture Mike now and feed him lunchtime salads every day. This healthy option is fast, easy, and means I get my vegetables in without really thinking about it. I’ve been loving curried shrimp salad lately because it’s super versatile and easy to put together! It’s a great excuse to whip out the BBQ too. Whether you’re looking for a lunch-time snack, a light dinner option, or something simple but special enough to serve at a party – curried shrimp salad is the perfect solution. It’s a great alternative to the usual tuna or chicken salad! I also, after 14 years of marriage, finally have Mike eating shrimp. It’s a miracle. I figure in another 14 years we’ll move on to lobster. Place the shrimp onto BBQ skewers and brush them with the curry paste. Place on the BBQ and cook for 3-4 minutes each side, until pink and cooked through. Combine the lettuce, cucumbers, carrots, and dressing in a bowl. Divide the salad between two plates. 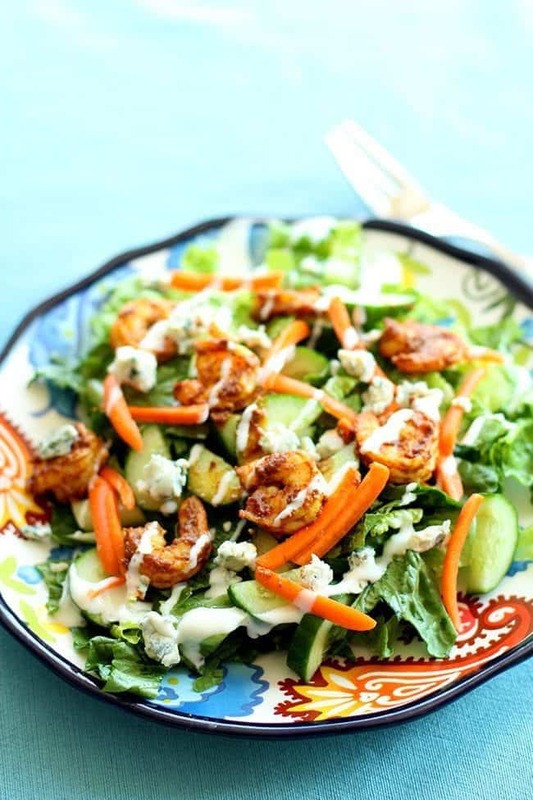 Top the salad with BBQ curry paste and blue cheese crumbles. This is literally a 10-minute lunch, and that’s if you have to chop the romaine lettuce as I did. It’s so fast, easy and healthy to make. Grill the shrimp up on skewers on the BBQ (top rack so they don’t burn) and they take mere minutes to cook! When I was looking for a sauce to use, I considered a few, but I knew right about that the mild curry paste was perfect. I didn’t want raging hot shrimp, I merely wanted a great curry taste with a smidgen of heat. I used ranch dressing and blue cheese to cool the spice down and it works like a charm, just like it does with buffalo sauce! Mix It Up With Vegetable Variations! You can mix in other vegetables, but you really need cooling vegetables when you are using a spicy spice like hot sauce or curry. Cucumber and celery and the best options for adding that cooling factor you need. This offsets the heat so that one element doesn’t overpower the other. Water chestnuts are also an amazing choice! Cucumber Salad with Tomato and Dill: healthy, fast, fresh, and full of everything that’s good for you! Creamy Tex-Mex Corn Salad with Green Chile Dressing: may I introduce you to the BEST salad dressing on the planet. Happy cooking everyone! 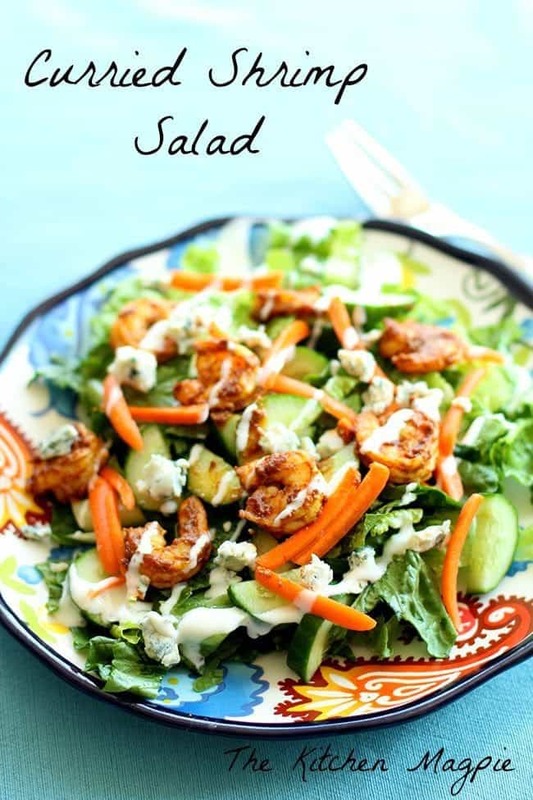 I hope that you loved this easy, super scrumptious salad! PIN THIS RECIPE to your SEAFOOD RECIPES Boards and Remember to FOLLOW ME ON PINTEREST! Easy, summery and delicious BBQ'd curried shrimp salad! Ten minutes is all you need for this amazing and healthy lunch! Place on the BBQ and cook for 3-4 minutes per side, until pink and cooked through. Cook them on the top rack so they don't burn. Combine the lettuce, cucumbers, carrots and dressing in a bowl. 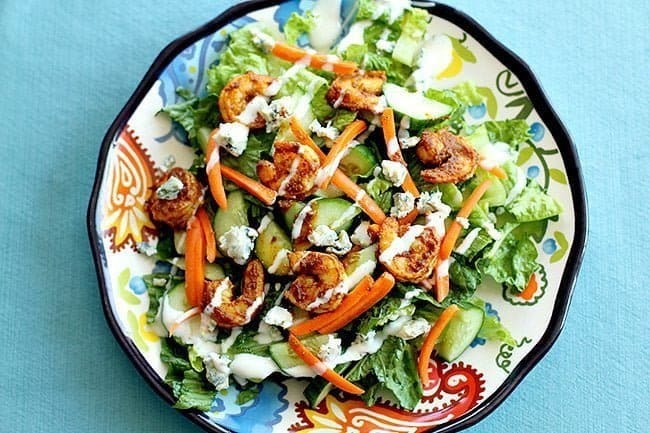 Top the salad with the BBQ curry shrimp and blue cheese crumbles. 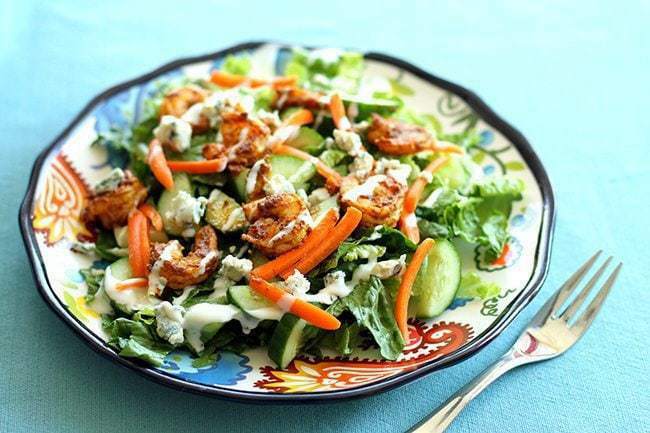 If I could eat shrimp, I’d love this salad!